A Basic “Black and White” brand countertop RO unit. The countertop reverse osmosis unit pictured above produces top quality reverse osmosis water at the rate of a couple of gallons per hour. The water quality is equivalent to that produced by an undersink RO unit costing double the price. It is an extremely versatile machine that can be used for many purposes. The countertop RO unit is most commonly used as a bottled water maker, installed to the sink faucet and allowed to produce water into a bottle. When the bottle is filled, you turn the unit off. You can then leave it in place or remove it. The drain water (all reverse osmosis puts out a trickle of reject water) exits via a separate hose that is simply dropped into the sink. The usual way to get water to the unit is with the standard diverter valve, like the one below, hooked to the kitchen faucet. You pull out the knob to divert water into the RO unit. The knob stays out until you turn off the water. However, there are many other uses and methods of installation. For example, the RO unit can be attached directly to a water line in a laundry room or patio–anywhere there’s a water source and a place to send the drain water. With a simple adapter it can take its water from a garden hose or outdoor faucet for use on a patio or greenhouse. 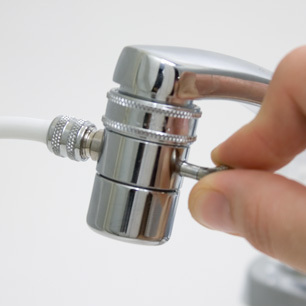 With modern day sink faucets, especially those with pull-out sprayers, it is often impossible the use the diverter valve. In this case the RO unit can be fed from an undersink water source identical to the inlet line used for undersink filters and RO units. In these installations, the feed line is pulled from under the sink and attached to the RO unit with a push-in fitting. After water has been produced, the RO unit is removed and the feed line is conveniently stored under the sink. See the picture below. 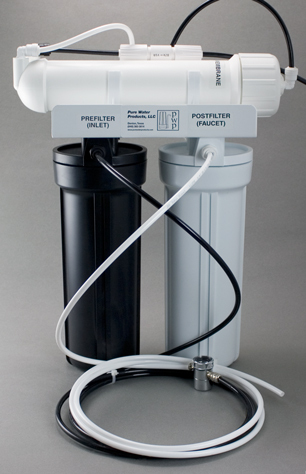 A simple adapter like the one in the picture can be used to provide water from a kitchen or laundry room undersink to a countertop reverse osmosis unit. The blue-handled valve can be located at a more convenient place nearer the delivery end of the tube if desired. When not in use, the tube can be removed from the RO unit and stored under the sink. Here are some more ideas for countertop RO units. Aquarium filler. Water is collected in a large container for subsequent addition to the aquarium. The RO unit can be turned off and on manually, or a simple automatic shutoff system can be added to the RO unit that turns it off when the container is full. The shutoff system is inexpensive and easy to add to an existing countertop RO unit. Outdoor pond filler. The unit can be allowed to fill the pond when it is turned on manually or it can be installed to top off the pond and shut off automatically with a float valve when the pond is full. 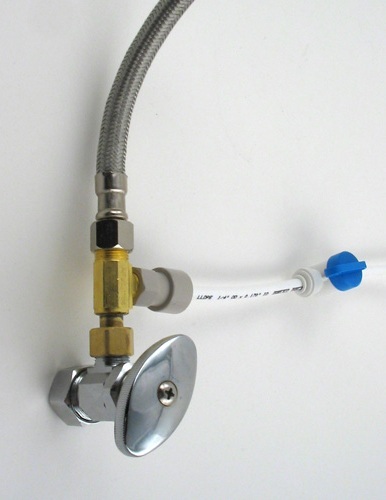 A garden hose adapter (see below) will allow the user to produce RO water from a garden hose. Final rinse water for a spot-free car wash. The water for car washing is usually captured in a small tank, then pumped to provide pressure for the car wash. A deionizing cartridge can be added to provide zero-TDS water if desired. The standard countertop RO unit can make up to 50 gallons of RO water per day (and it can be easily modified to produce more). The pump setup is easy to make from standard water treatment parts. High quality water for plants, either in small outdoor gardens or greenhouses. This application also requires capturing then pumping the water to the point of use, although small drip systems can be designed that take water directly from the RO unit. For small operations, the water can be produced into a small tank and then dipped out with a bucket or pitcher to water plants. High quality water for dehumidifiers or other appliances that require water that does not leave mineral deposits. Again, it is easy to modify the RO unit so that it feeds water to the appliance upon demand. 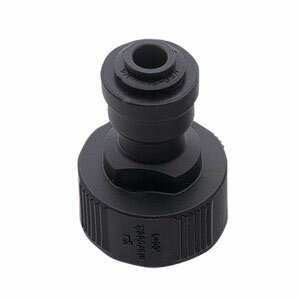 This handy fitting screws onto the end of a garden hose or outdoor faucet to make an easy connection to a countertop RO unit. It is provided free for the asking when a Black and White countertop RO unit is purchased. More about Countertop RO Units.